Summer holds so many great food memories from my childhood in Italy. One of my favorites is the smell and taste of a ripe tomato right off the vine. Everyone in our town had a vegetable garden, and no matter its size, there were always lots of tomato plants. After all, the gravy (sauce) that we canned had to last for a whole year of pasta meals. 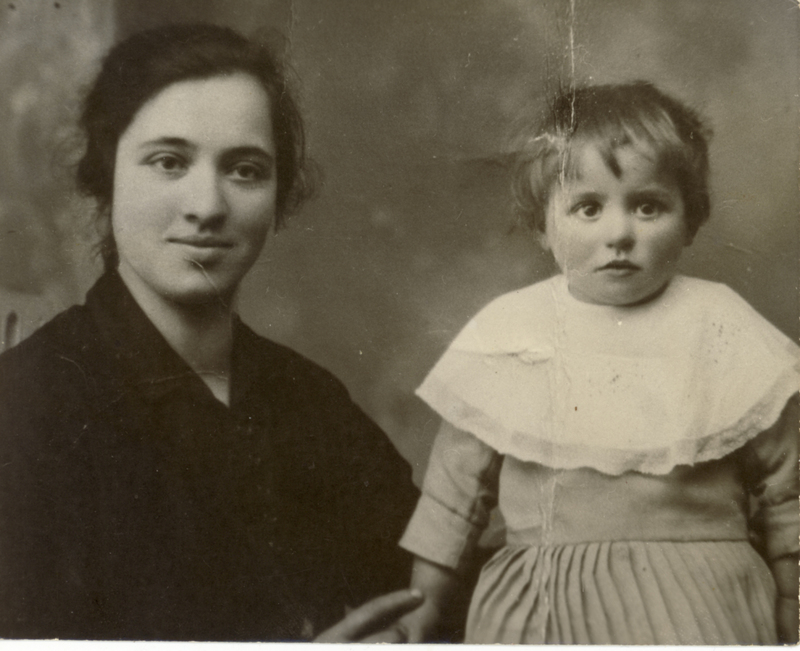 My nonna loved to harvest the plum tomatoes. She cut them in half, squeezed the seeds and liquid out, sprinkled them with salt and placed them on a white sheet in the sun to dry. While helping nonna, I got to taste them as they grew progressively dryer and more intense in flavor. Yum! My mom did the rest of the work with the tomatoes. She blanched them and ran them through a food mill to remove the skin and seeds, and then put them in jars. It was a time consuming task that was repeated a number of times during tomato season, and well worth it. When we emigrated to Philadelphia, lacking enough room in our back yard to grow all the tomatoes we needed, we purchased them at the outdoor vegetable stands in the 9th Street Italian Market, or we would pick them ourselves on farms in South Jersey. And when mom finally discovered the joys of the tomato machine, canning only took a day, or done leisurely over the weekend. The tomatoes were blanched and ladled into the hopper. One of us kids would turn the handle, and, wonder of wonders, the pulp and juice would slide down the chute, while the skins and seeds were spit out at the end of the cone-shaped screen. It was much faster than using a food mill, but also messier. By the time we were done, the stove, wall, and counters were speckled red. The following summer, tomato canning moved to the yard. Come every August, the aroma of cooking tomatoes wafts out from many postage-stamp yards in South Philly. There are a number of tools to separate the juice and pulp from the skins and seeds. 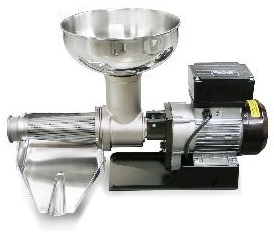 For a small quantity, a food mill will do the job quite nicely. (It’s also handy for pureeing lots of other foods.) Get a stainless steel one that has a base plate with small holes. 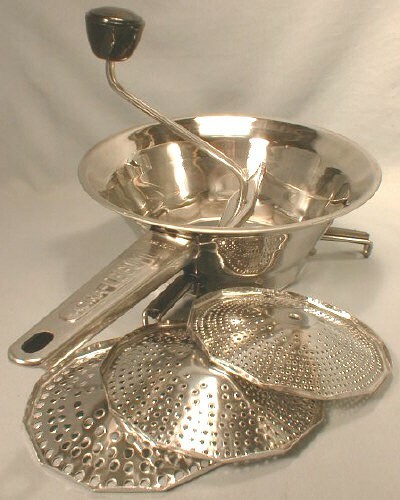 Our most popular for this size of jobs has been the #3881 2 Qt Stainless Food Mill with 3 Discs, made in Italy. If you plan to preserve enough tomatoes to last through the winter, the next step up is a model that clamps to your table or counter. 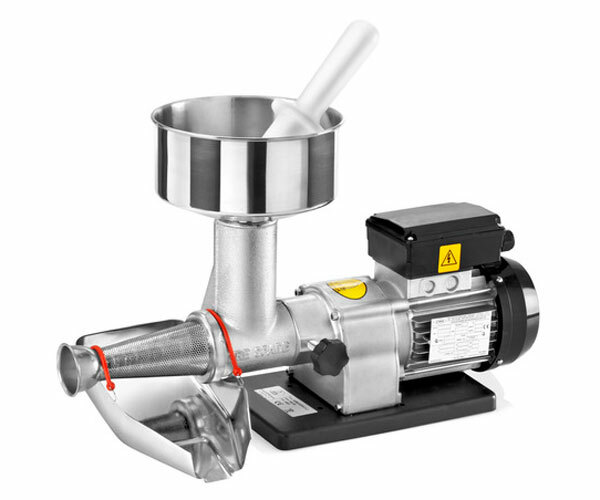 Though this tomato squeezer requires a strong arm to keep turning the handle, it will get a large job done much faster and more efficiently than a food mill. Its auger presses the tomatoes into the screen filter, the skins and seeds come out of the front of the cone, and the pulp and juice come down the chute under the screen. 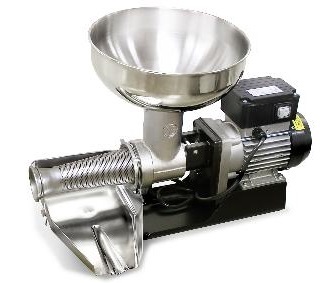 The #615082 Norpro Sauce Master II Tomato and Fruit Press is made of cast aluminum, with a stainless steel screen and plastic auger and funnel bowl. It has a covered chute, and a suction base in addition to a clamp. There are a variety of attachments you can purchase separately for other applications, like a Berry and Pumpkin Screen for this manual tomato press. Everyone who has tried it will tell you that the quickest and easiest way to squeeze tomatoes is with an electric tomato machine. There are various sizes available, to suit however many tomatoes you plan to preserve. The #10606 Fabio Leonardi 380w Electric Tomato Machine is also made in Italy, and has a .5 hp motor that will mill about 400 pounds per hour. The directions claim a larger output, but in reality, don’t plan on more than 400 lbs. This machine has an automatic shut off to prevent overheating on big jobs. This model is also available with a bench (#10600). The #10602 Fabio Leonardi 570w Electric Tomato Machine has a 1 hp motor.  Families and restaurants who want to get the job done super fast use this size. This model processes about 600 lbs per hour and also has an automatic shut off to prevent overheating. This model is also available with a bench (#615989). Come on over to the store for helpful advice on choosing the perfect tomato squeezer for this year’s fresh crop.